Recently SanDisk the Solid State Drive maker has announced that, its mini Serial AT attachment (mSATA) SSD memory chips have been adopted by Fujitsu. They have adopted it mainly for its recently-announced Ultrabooks and by Lenovo for its ThinkPad Edge-series notebooks. SanDisk also manufactures other memories like flash card and USB flash drives, but is estimated that the SSD business is the fasted growing division for them. This has been even increased with the growing popularity of the tablets and the Ultrabooks and even Smartphones which mainly are equipped with the SSD memory. 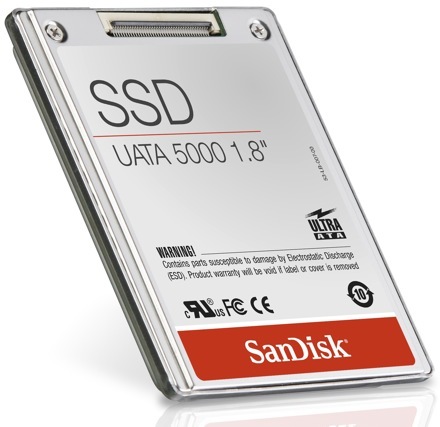 These SSD’s improves the performances and even reduces the startup time for these devices. It seems like Fujitsu has selected the 32GB iSSD drive memory for its LifeBook line of Ultrabooks. The iSSD technology is said to have coupled with Condusiv Technologies’ ExpressCache software which helps in system startup as well as application loading. It has also been confirmed that Lenovo has chosen the 16GB U100 mSATA SSD for its new ThinkPad Edge E430 and E530 notebooks. Forbes has recently pointed out a few major factors which might be responsible for driving the SSD demand in the market. They pointed out tablets and Ultrabooks are making them more popular. The tablet market is growing very fast till now and is also expected to grow further. So it has also increased the SSD business in the market. The next factor the Ultrabooks which are recently getting much popular are also expected to increase the SSD as business in the future. Apart from all these devices the SSD itself may also make a good business on its own as it processes faster and can manage more operations per second. As the applications are getting more data dependent and some of them are also being deployed on the cloud they need a fast storage device which is possible only with the SSD. So these Drives are expected to gain a lot of popularity in the recent future, the customers might be waiting for a price decrease.